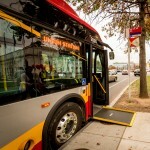 DC Circulator is committed to providing reliable and accessible service to all. We readily welcome senior citizens and people with disabilities and our vehicles have accessibility features that help make it easier. The following information details Circulator’s structures and policies in compliance with the Americans with Disabilities Act. Circulator buses can accommodate all types of wheelchairs and mobility scooters, up to two at a time. The general requirement is that the mobility device must fit on the ramp and be able to maneuver to the wheelchair securement area. All buses kneel or lower to make it easier to get on and off the bus. 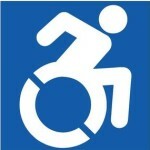 They also are lift-equipped or have a low floor ramp for disabled riders using a mobility device. Persons who need the ramp lowered are encouraged to wait in the middle of the designated bus stop in clear view of the operator. This will help the operator know to deploy the ramp or lift, which helps save time. Circulator technicians are trained in maintaining the operational effectiveness of lift buses. If you need the ramp or lift and it has not already been lowered, just ask the operator, s/he will gladly deploy the lift or ramp for you. Patrons in wheelchairs or scooters that are able to be secured to the bus are asked to keep their device secured at all times while traveling on the Circulator. 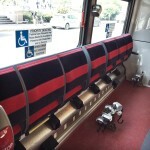 Two wheelchair securement areas are located either near the front or the middle of the bus. The securement areas include tie downs and lap belts that can safely secure a variety of mobility devices. People using wheelchairs and motorized mobility aids have first priority for the accessible seating area. Our policy requires that the operator ask other passengers sitting in the wheelchair securement area to move to another area of the bus when a wheelchair passenger boards. Bus operators are instructed to announce major intersections, landmarks and transfer points on all buses. Stop buttons are located in the priority seating for persons with disabilities to alert the driver when the bus is approaching his or her stop. Rides are free for all customers. No special payment method needed. To access information on the Circulator’s routes, schedules or accessibility policies by telephone, call our customer service line at 202-962-1423. For those riders unable to use local bus (including the DC Circulator), Metrobus or Metrorail service, the Government of the District of Columbia provides transportation through the WMATA Metro Access program. 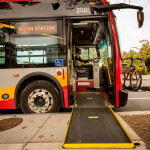 Mobility/Paratransit is a specialized, curb-to-curb service for people with disabilities who are not able to ride fixed-route public transportation, including lift-equipped buses. For more information, visit WMATA’s Transit Accessibility Center or call: 202-962-2700.